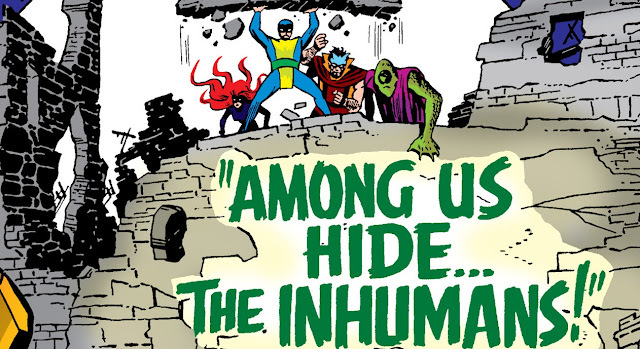 Welcome back to the Inhumans key issues post, and in terms of Inhumans key issues, this one is a biggie. In this issue, we get to meet for the first time, most of the remaining members of the Royal Family that we haven't seen yet. There are a few that don't make their appearance in this issue, but I will get to some of them in the near future. It's already been confirmed that every character that makes their first appearance in this issue will be featured in the new Inhumans T.V. show that premiers later this year. Now, there's so much key issue goodness in this issue that I'm not entirely sure where to start. I guess I'll just follow along with the comic and talk about the characters as they appear. After the long battle with Gorgon and Dragon Man that started in the previous issue, Johnny Storm (Human Torch) decides to go for a walk to "clear the ol' cobwebs". As he walks past an alleyway in a not so good part of town, he sees a beautiful woman that he instantly falls for. She is startled when he tries to talk to her, and immediately there is a huge gust of wind that blows around a lot of garbage and debris. After the wind subsides, the beautiful girl is nowhere to be found. This beauty is the Inhuman known as Crystalia Amaquelin, or Crystal for short. She has the power to manipulate the four elements, earth air wind and fire, but she can also manipulate electricity. Now, Johnny can't get this beauty out of his head and decides to go back to the part of town where she pulled the ol' slip on him. Eventually, he see her again, and again, she tries to run away from him again, this time setting a pile of wood on fire as a distraction. As Johnny "Flame's On" to absorb the fires energy, Crystal see that he has powers just like she does, and decides to invite him to her "home" to meet her family. 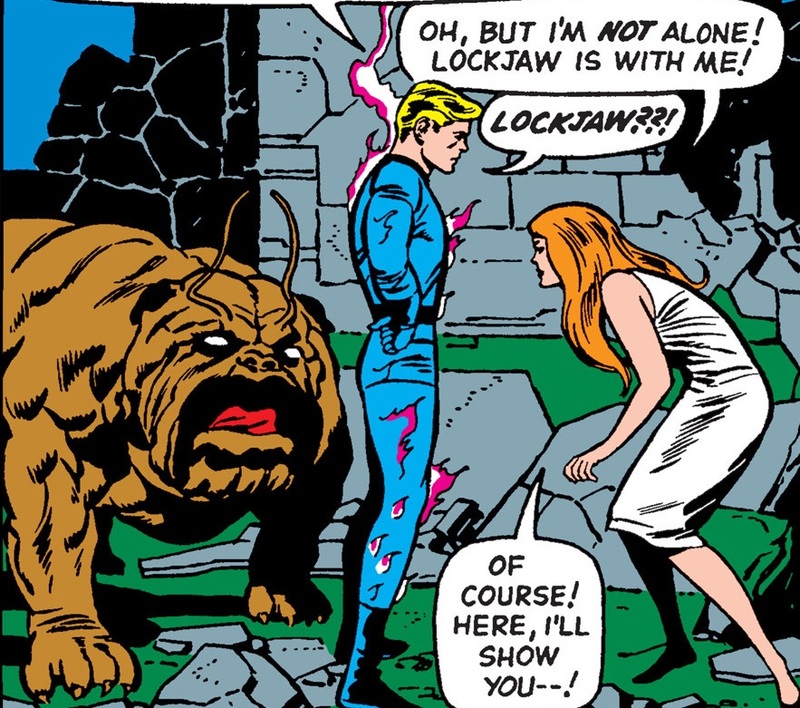 This is when we get to meet Lockjaw. He is an Inhuman that looks almost exactly like a giant, over-sized bulldog, with antenna protruding from his massive doggy forehead. 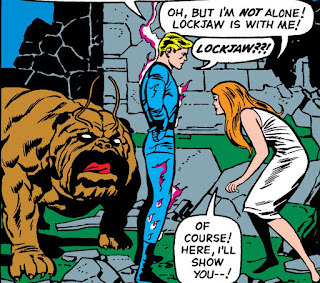 Crystal needs Lockjaw to get her home, because he has the ability to create portals and teleportation. So Lockjaw creates a portal, and Crystal and Johnny walk on through to meet the fam. Now that we're under the city, and in the home of the Inhumans, we quickly meet most of the remaining members of the Royal Family, except for Black Bolt that is. We're told that he "isn't home right now". So moving on, we meet Karnak. When we first see him, he is standing in front of a monolith of marble, studying it. With one swift chop, the giant block is obliterated, and turned into a million much smaller pieces of marble. You see, Karnak has the ability to find the weak spot in any object, making it easy for him to destroy it. Johnny's cover is blown when he runs into Gorgon and Medusa. He has already had run in's with these two and they know that Johnny is not an Inhuman, like they are. This is also the time that we meet Triton, and as his name might suggest, he is an aquatic member of the family. He cannot live out of the water without his special aquatic suit. 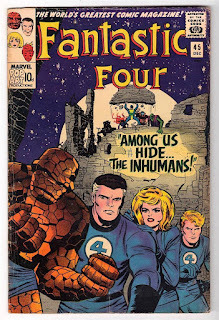 Realizing that Johnny Storm isn't who he was pretending to be, the Inhumans try to set a trap for him, but ultimately he escapes and is able to summon the rest to the Fantastic Four. 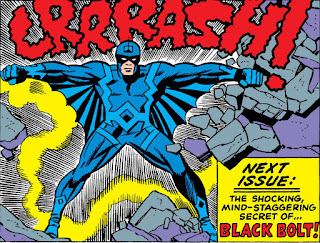 They arrive at the home of the Royal Family to do battle, when, on the very last page, in the very last panel, we finally get to see Black Bolt. But, we'll have to wait until the next issue to find out more about him, and what happens to our heroes. This is one of the Silver Age comics that has a UK Pence Edition. Not every comic from this era does, and I'm not sure why. I thought that Marvel would try to get as many foreign readers as possible, and doing that with the occasional issue seems less likely to do that. Oh well, I'm sure they have their reasons. Anyway, like I've mentioned in earlier posts, the only real difference between the UK version and the U.S. version, is in the corner box art. There you'll see 10d instead of the 12¢ that we use here in the States. Other than that, I believe the cover is identical. I can't be 100% sure since I haven't seen a copy, but I'm rather positive that the indicia on the first page will reflect the price difference as well. CGC was nice enough to put the UK edition under a separate label and have a separate census for it. So, for the very under printed UK edition, CGC has so far only graded 11 of them so far. I have no idea is this is a true indication of the ratio of U.S.to UK editions. It may be, but if a lot of copies are still in the UK, collectors might not want to spend the money to send them over seas to have it graded. I'm sure it costs them quite a lot more to have comics graded that it does for us over here. If you were lucky to have this comic in your collection before any movie or T.V. show hype, then you were able to make a little bit of money on it if you threw it on the market. You probably still could. Before they hype, this wasn't a comic that was on anyone's radar, and was most likely only being bought by Fantastic Four or Inhumans fans, not the speculators and investors that are buying them up now. I'm going to use a nice, high grade 9.2 NM- copy as an example. All the way back in Nov. 2012, a copy sold for only $670. That's really not to bad for a high grade Silver Age key issue. only about a year later, another CGC Universal went for $865. That's not a bad bump in value, but it's still well under the $1,000 mark. Then the hype hit. Soon after, this comic hit that $1,000 mark, then the two, then three, and even the $4,000 mark. 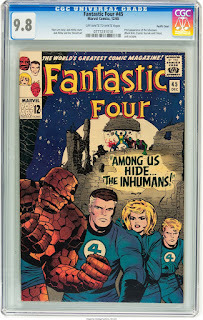 In fact, the latest sale on eBay for a CGC Universal 9.2 NM- copy of Fantastic Four #45 sold for $5,400. Wowza that a lot of dough. But in all honesty, I can't see this comic sustaining that price as it moves forward. Some of the lower grades have already seen a slight downturn in terms of sales, as you can see by the all of the red on the chart to the left. This is usually the case in today's market. One loses interest in a comic when the next hot comic hits, sending values for this particular comic down. So, if you like the Inhumans, and want to snag their first appearance in this issue, you may want to hold off for just a little bit longer for the prices to come down a little bit more. Maybe once the T.V. show finally airs. However, I don't think you'll ever be able to get it for the prices that they once were, but I'm sure you'll be able to get it a little cheaper than they are right now. Happy hunting.